If you’re looking for an effective way to charge the best laptops on the go, you’ve come to the right place. 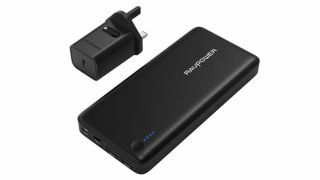 We’ve gathered up the best portable laptop battery chargers and power banks, looking at the easy and portable ways to charge your laptop right now. When you go out shopping for a battery charger, it’s important to find one that stores enough power to top up – or even recharge – your laptop’s battery when its running low. The best laptop battery charger should mean you’ll never have to frantically search for a power socket when working while traveling – even if you are using that stylish Ultrabook with the tiny battery. You won’t have to worry about getting stranded in the middle of nowhere when you buy one of the best portable laptop chargers. With these convenient devices, you can make sure you can always get your work done – no matter where you are. With the Mophie Powerstation AC, high power output is the name of the game. This portable laptop battery charger is able to power a 15-inch MacBook Pro. Meanwhile, the USB-C port is rated at 30W with a USB-PD label, meaning its one of the few batteries capable of fast charging an iPhone X or iPhone 8. If you have a newer laptop, and find yourself running out of juice throughout the day, the Omni 20 USB-C might be for you. Not only does it have an insanely high capacity, but it also allows charging of multiple USB-C devices simultaneously. So, if you’re working and you need to charge your Nintendo Switch and a mobile device, you go for it. Plus, the Omni 20 also serves as a USB hub, clearing out some extra storage space in your bag. The PowerAdd Pilot Pro2 doesn’t just come with 10 connectors that cover most of the laptops on the market today, but it’s backed by a two-year warranty. That means you can use the 23MAh/85Wh capacity without worry. The Pilot Pro2 is also light enough to carry around wherever you go, coming in under 560g. The only thing that holds it back is that it doesn’t have any USB-C connectors, so if you have a modern Ultrabook or MacBook, you may want to go elsewhere, otherwise you’ll have to carry a separate power supply to keep the battery charger backed up. As technology marches forward, new laptops need less power to function. This is especially ture for high-end laptops like the MacBook Pro, HP Elite x2, Huawei Matebook Pro X or the Dell XPS 13. For all of these devices, and more, USB-C is king – the RAVPower uses this revolutionary connector to deliver up to 30W of power, which should be plenty for the best Ultrabooks. You can recharge it using a 30W wall charger that can also be used to power compatible laptops – very handy, indeed. The MaxOak MacBook Charger is a perfect example of a laptop battery charger that goes the extra mile to make sure that it matches the expectations of its audience. This portable laptop charger has all the hallmarks of an Apple device, without the logo – but that’s what those Apple stickers are for – with a matching brushed aluminum finish. It’s the second most capacious portable laptop battery charger on this list, but its huge amount of juice comes with a catch – it carries so much power that at least one airline has outright banned it, so bear that in mind if you plan to use this charger while traveling. It’s also pretty heavy at almost 1kg and will cater to most MacBooks, but nothing else. The Qi Infinity Upgraded Powerbank is the only product here that targets Microsoft’s popular Surface lineup by offering the appropriate DC output voltage. It comes with a generous five ports, four of which will let you charge other 5V devices (which includes anything from other power banks to tablets and smartphones). But, what’s really interesting here is the addition of fast charging through Qualcomm’s Qi tech. You’ll be able to charge the new MacBook as well, but no traditional laptops that rely on a 19V DC output. Just keep in mind that with a capacity of 35Ah, it might not be allowed on some airlines. The K2 is the world’s second highest mountain and it is fitting – to some extent – that MaxOak named this battery after that lofty peak. After all, at 50Ah, this is the biggest battery on our list and one that is also the heaviest of the lot. It supports laptops up to 60W (3A, 20V) as well as fast-charging. Note that it takes up to eight hours to charge the battery and that can only be achieved via a proprietary charger. Sadly, it doesn’t carry a USB Type-C connector – which makes it useless for newer laptops – and you won’t be able to lug it around on the plane (as with the previous two peripherals, the massive capacity here may mean it’s banned on some flights). Sandberg's Powerbank is neither the cheapest nor the most powerful around. However, it does come with a couple of features that make it a rather enticing option. It outputs a number of voltages (12V, 16V, 19V and 20V), automatically choosing the right one depending on the device which is connected. This portable laptop battery charger also features two USB ports, and they’re hardwired to output 5V. You’re also supplied with 12 different charge tips, but if you have an Ultrabook that needs a USB Type-C port for charging, you’ll be out of luck. It also features a premium brushed aluminum finish, with bright blue LED status lights that clearly indicate the amount of juice left, or how close the battery is to full charge. This product is only available in the UK and Australia at the time of this writing. US readers, check out a fine alternative in the MaxOak K2. If you are looking for a versatile laptop charger, then do consider this RavPower offering. It is by far the most expensive model on our list, but this Reddot award winner carries a feature that no one has replicated till now. It has an AC output that can deliver up to 100W of power – yes, this could even power a TV if needed. Note that you will probably need an adaptor (there’s one bundled) because the power bank can only accommodate two-prong plugs. You will be able to take it on a commercial flight, but you will not be able to recharge it via USB. Dell sells the Power Companion with various battery capacities. It is more compact than the RAVPower models, and the unit looks like a Dell power brick that charges your laptop. When you're at your desk, you can daisy-chain to recharge the Power Companion and your Dell laptop by connecting your Dell charging brick to the Power Companion, and then connecting it to your notebook. Dell's Power Companion is a far sleeker battery pack if your office relies on Dell Inspiron, Latitude, XPS or Venue laptops and tablets, with the added benefit that it has extra USB ports should you need them.